I was struck by the shortness of the cranks and wondered if that was a fatbike or ebike necessity. Cranks are scaled to the rider's size. There is no inevitable link to tyre width or electrical assistance. But, years ago when I went into crank length, I heard considerable persuasive opinion that, unless you're really rather short or tall, the common 170mm cranks will suit you fine, an opinion widely supported by the wide steps between crank size: 165 170 175. About that time too someone tried to market 172mm cranks on the assumption that they were somehow (magic?) more efficient; not too many were sold. In theory, though, longer cranks should give you an easier ride (longer movement at the pedal for the same number of chainring/sprocket teeth turned), though it will probably wreck your knees in short order. This is me, exactly. I cannot tolerate 172 or 175mm cranks; my knees describe too-big circles for my preferred fast-light hummingbird cadence. For me, it is 170 or nothing for all but the very shortest casual rides. I do have a 1970 u-frame Folder with Thompson (design) bottom bracket ( https://en.wikipedia.org/wiki/Bottom_bracket#Thompson ), 3-sp S-A IGH, 406mm EWD wheels and 150mm(!) cranks. Oddly, I find I cannot spin them as fast as I can my 170s. I'm guessing it is purely due to muscle memory, as I "should" be able to spin the shorter cranks, but 150mm is a pretty big jump shorter than 170mm. One thing I do notice with the 150s is a real lack of torque compared to my regular 170s, understandable given the shorter moment-arm and reduced leverage. Cranks are scaled to the rider's size. Not always. The bicycle designer Mike Burrows uses very short cranks. I use 150 mm or 155 mm cranks, they solved the knee problems I used to have with the 170 to 175 mm cranks that ought to be more suitable for my height. As far as I can tell, this change didn't slow me down, I just pedal at a higher cadence than before. When I ride a borrowed bike, 170 mm cranks feel strange. How about an E bike with Rohloff Anto, best of both worlds. friend is giving me a go on his EBike next week cost him over 3000euro he travels all over Ireland on it he loves it.kalkoff is the make . Yep, I have a friend who has one of those, Anto. He's a lifelong cyclist, now in his 80's. When he told me he had a Kalkoff, I said, "Good on yer, Ken. Anything ending in -hoff is sure to be good. An Irish guy on the Thorn Forum told me so." "An Irish guy on the Thorn Forum told me so." Guys, there's a fellow in Canada just panting for you to sell him the Tower of London, and the six original Penny-Farthings stored in the basement. Preferred currency is metecais, bags of 'em, fresh & unnumbered. Anyone who wants to look up John's sly joke should try the preferred Portuguese spelling of "meticals"; preferred anyway by whoever designed the banknotes. I remember the country the metical belongs to from back when any car on its "roads" was likely to belong to a tourist, and a bicycle was luxury transport for 99pointsomething% of the population. 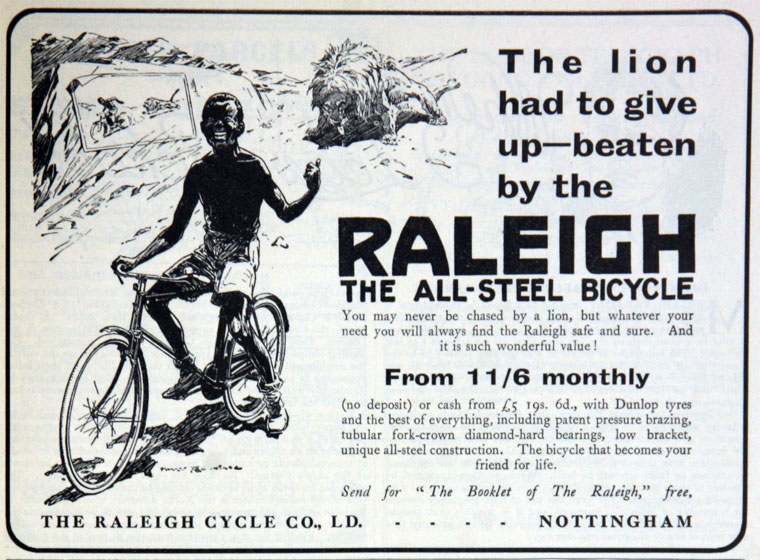 The famous Raleigh advertisement, of an indigenous fellow pedaling hard to escape a hungry lion, could have been set there (and was indeed set less than a thousand miles north, not a huge distance in the subtropics); it's referenced in the inset below. John this guy is a great charactor dyes his hair pink varnished nails dresses weird ,great guy decent as they come.i met him the other day in a store bought my grandaughter a big cream bun i have a few cycling jerseys for him so he said he would call down during the week for them and i could try out his Ebike, he has 6500 miles on it never gave him one bit of bother ,not sure if it's a hub sure ill give it a go bit expensive for me though 3500 wow.